Zoom Airlines has been operating low-fare, long-haul services from most of Canada's large airports to various British and French destinations for several years. Its success has led the carrier to establish a UK affiliate with the same name to fly to the United States, Bermuda and the Caribbean. Zoom UK is now serving New York JFK daily from London Gatwick and Zoom looks set to become the first long-term success as a low-fare, long-haul scheduled airline. In the pastdecade, low-cost airlines have sprung up throughout the world to revolutionizeshort-haul air travel. Now, following the success of low-fare carriers such asEurope's easyJet, Malaysia's AirAsia and Brazil's Gol on shorter routes, peopleare wondering if the same business model could work equally well for longerflights. If thisproved the case, the days of huge network carriers such as American Airlines,Air France-KLM and Singapore Airlines could be numbered. But there are argumentsfor and against the notion that low-cost airlines could eventually dominate thelong-haul international market. The idea oflow-fare, long-haul airlines isn?t new. Sir Freddie Laker pioneered the ideawith his SkyTrain DC-10s between London and New York in the 1970s, andPeopleExpress took up the mantle in the 1980s. Both airlines ultimately failed. The mainargument against such airlines succeeding is that, on long-haul routes, allairlines face certain levels of cost. For example, they cannot stick too closelyto the "no frills" concept: they need to provide in-flight food andentertainment to keep passengers happy, said aviation financier BertrandGrabowski, a member of the board of managing directors of DVB Bank. Also, whilelow-fare airlines usually prefer to serve cheap secondary airports, this may provechallenging with long-haul services, where airlines may need to marketthemselves to large numbers of people connecting from other airports. Turnaroundsof long-haul flights usually take much longer than for short flights, andairlines can't achieve the "compact," crew-efficient operations thatare possible with short-haul networks, said Grabowski. Also, cargo-handling costswould basically be the same for low-cost and traditional airlines on long-haulroutes. "Webelieve that the cost structures of low-cost carriers on short-haul routes areprobably around 40 to 60 percent lower than the legacy airlines," saidGrabowski. "We're not sure you can have the same kind of differential whenyou move to long-haul." A cost advantageof 20 to 25 percent is more likely, he thinks. With this, low-cost airlinescould compete in long-haul markets, but their progress would be "nothingto compare with the development of low-cost carriers in Europe and the U.S."
Anotherproblem is that some fast-growing airlines appear to regard market share andrecognition rather than profitability as their prime business goal and areprepared to keep fares artificially low. And no scheduled airline has yet trulyproved the viability of a low-cost, long-haul business model over the long term. But a compellingargument for the success of a new generation of low-cost, long-haul airlines isthat several are now operating and doing well so far. 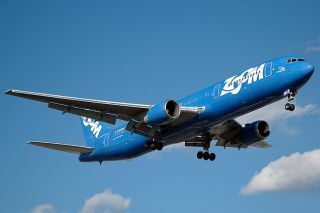 The all-blueBoeing 767s of Canada's Zoom Airlines have operated scheduled services forseveral years to British and French airports. In 2006, the Ottawa-based carrierformed a UK subsidiary, which has begun low-fare services to New York and Bermuda from London. Oasis HongKong Airlines, which began flying nonstop to London Gatwick in October 2006 withBoeing 747-400s, is filling more than 85 percent of its seats with payingcustomers, said the airline's commercial director Ken Chad. It recently startedserving Vancouver and plans eventually to serve 60 major cities, all at least eighthours' flying time from Hong Kong. Oasis hasthree key criteria for selecting a destination airport. "It has to be amajor business destination; it has to be a major cargo destination, because wecarry cargo in the belly holds of our 747s; and it has to be a low-cost carrierhub," said Chad. "About 26 percent of our traffic is self-hubbingwith low-cost carriers." Berlin, Milan, San Francisco, Oakland, Chicago and Los Angeles all feature in Oasis' route plans. Not coincidentally,all have airports that are large centers for low-fare, short-haul airlines. Aircraftchoice could prove important in determining the success of low-fare,long-haul airlines. Existing low-cost carriers such as Germany's Air Berlin and TUI Group have ordered Boeing787s -- which Boeing says will be 20 percent more fuel-efficient than today'ssimilarly sized jets -- to move into long-haul operations. FlyAsianXpress -- in which Sir Richard Branson's Virgin Group has taken a 20percent stake -- has ordered 15 new Airbus A330-300s. The new long-haul arm ofVirgin Blue, V Australia, has ordered Boeing 777-300ERs. But Europe's largest low-fare airline Ryanair, which recently announced its desire to fly transatlanticroutes with 50 widebody jets, is taking a different approach. Ryanair will waitfor the aircraft market to soften before deciding if it can buy new or used jetscheaply enough to operate very-low-fare transatlantic services. Oasis Hong Kong loves the 747-400. "It's quite expensive to operate -- unless you can fillit," said Chad. As long as Oasis can fill the 260 economy-class and --crucially -- the 83 business-class seats on each of its 747-400s at prices 40to 65 percent lower than its competitors, it will make money, he said. Its competitivetargets aren?t the other airlines providing nonstop service on its routes. Instead,Oasis targets carriers offering one- or two-stop connecting service. These airlinespost the lowest fares, but since each takeoff and landing burns lots of fuel, theircosts are higher than those of the nonstop carriers. Targeting connecting carriersis "proving extremely effective," said Chad. Chad argues that because aircraft burnmuch more fuel on takeoff and landing than during cruise flight, long-haulroutes are more suited to the low-cost model than short-haul networks. Each Oasis747-400 is in the air for more than 15 hours a day, a utilization rate thatshort-haul airlines can only dream about. Ultimately,the survival of low-cost, long-haul carriers may rest on their ability to attractbusiness and high-end leisure passengers with low business-class fares. Oasispromotes the idea of "affordable luxury" so strongly that although ithas been operating less than a year, some people have already flownbusiness-class with the airline 30 times, said Chad.